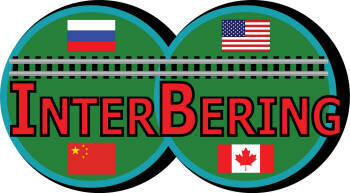 Fyodor Soloview, President of InterBering, LLC received support from Russian Railways to build US-Russia railroad. 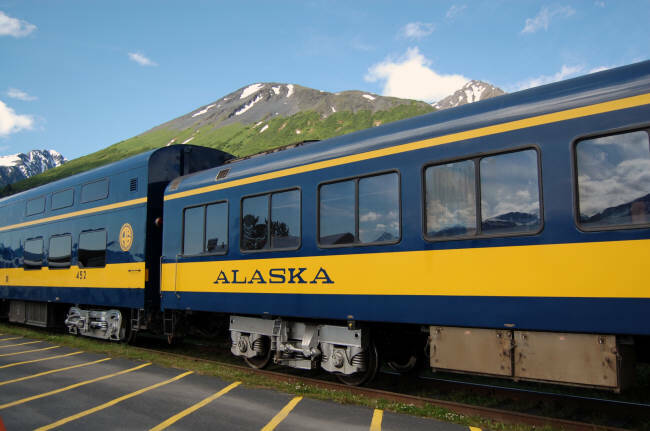 Alaska Governor Mike Dunleavy is asking President Donald Trump for permit needed to connect Alaska railroad to Canada, Lower 48, supporting A2A, owned by Sean McCoshen. "BIG TICKET". Is Alberta to Alaska Railway Port Mac's Sugar Savior? 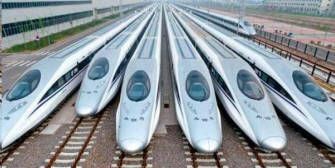 The railway may become a reality in 2022 if Sean McCoshen of A2A Railway has his way. By Dennis Anderson, AP, Jan. 3, 2019. 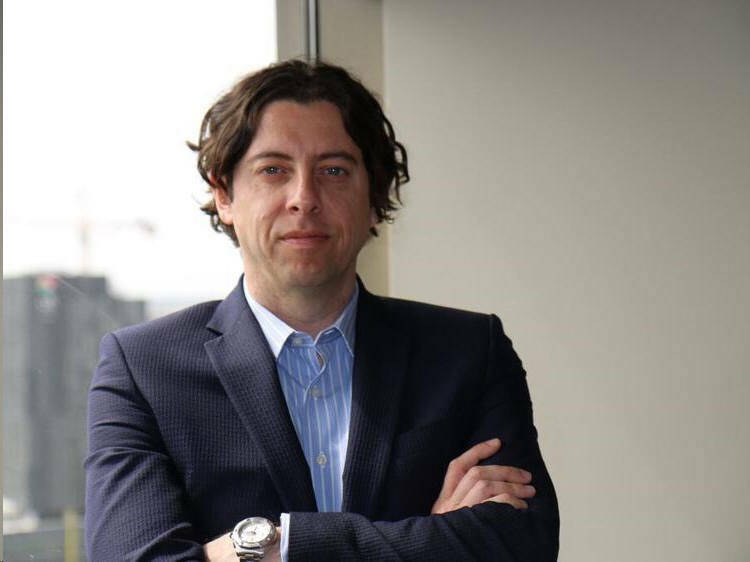 Sean McCoshen, Owner & SEO of A2A, Alberta to Alaska Railway Development Corp., plans to raise money for the $17 billion, 1,700 miles of rail project to Alberta's tar-sands oil fields, with 200 miles of that in Alaska. By Alex DeMarban, Anchorage Daily News, April 1, 2019. Link. Author: Alex DeMarban , Anchorage Daily News, April 1, 2019. Link. An Alaska Railroad freight train travels near Girdwood, Feb. 14, 2019. "A2A will make Alaska's ports the closest to Asia in North America," Mead Treadwell, a former Alaska lieutenant governor and consultant to the Canadian company, told a reporter on Thursday. The company plans to raise money for the $17 billion project. It does not intend to seek state funds, Treadwell said. 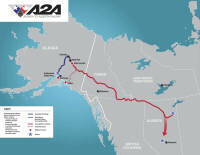 A2A would build 1,700 miles of rail to Alberta's tar-sands oil fields, with 200 miles of that in Alaska, reaching the rail system at North Pole. The company has offered ownership to tribes, Native corporations and First Nations along the route, groups that could help win regulatory approval. The company, co-founded by McCoshen, has spent $35 million on engineering and other studies, according to the plan. An entrepreneur with a banking background, McCoshen told lawmakers he's willing to spend more money, including completing the extension of the railroad to Port Mackenzie for $125 million, from Houston, Alaska. "I'm not going to spend that kind of money if I didn't think I'd get money doing it," McCoshen told lawmakers. Treadwell says the link would relieve congestion at West Coast ports in Canada and the U.S.
Railcars would move overland to Cook Inlet, carrying passengers and freight. 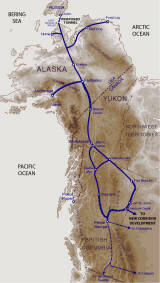 Cargo would include bitumen, the semi-solid, tar-like form of crude oil, potash used in fertilizer, and ore from mines. Asian imports could be hauled into Canada and the Lower 48. Estimates show the project would generate at least $4 billion in annual revenues, the company says. The state would benefit by renting right-of-way to the company, and through tariffs paid for railcars traveling through Alaska, Treadwell said. "I've never seen a project that was more economic than this one," Treadwell said. The Mat-Su Borough has negotiated closely with A2A in recent months over completing the 32-mile extension to Port Mackenzie, said James Wilson, an internal auditor with the borough. The state spent $184 million on the project, and A2A is offering money to finish the job, he said. One question: Determining a lease rate for the use of borough land that's fair to both parties, he said. He said the borough is doing "due diligence" to make sure bitumen will be hauled safely. It's also looked into media reports in Canada about allegedly improper financial actions by another McCoshen company, the Usand Group, as it worked with First Nations entities in Canada. McCoshen has denied the allegations. The borough hasn't found anything of concern at this point, Wilson said. "There was no substance to the allegations," Treadwell said. Dunleavy, in his Feb. 13 letter to Trump, obtained by the Daily News through a public-records request, says past efforts to connect the rail systems haven't advanced because the potential cargo didn't justify project costs. That's changed as Asian countries demand more resources, and container traffic grows. "Mr. President, Alaska has long sought better surface connections to the Lower 48 states," Dunleavy said in the letter, acquired by Anchorage Daily News through a public records request to Dunleavy's office. "We see it in the geopolitical interest of both the United States and Canada to have the basic permission for this project to move forward," Dunleavy wrote. A presidential permit is required for cross-border infrastructure. A2A's effort was triggered by a 2013 feasibility study paid for by the Alberta government, Dunleavy writes. The company is preparing to apply for the presidential permit. It's working with state officials, including with the Alaska Railroad Corp., to select right-of-way, he writes. Alaska Railroad spokesman Tim Sullivan Jr. said while past efforts have failed, there seems to be an "unprecedented" level of activity around the A2A proposal. The governor wants Trump to issue the permit before a detailed environmental review of the project is launched at the federal level. That will help provide certainty to attract investors, Dunleavy wrote. Dunleavy and Trump, both Republicans, have offered each other support. On Feb. 15, two days after the letter to Trump, Dunleavy released a video offering to send Alaska Army National Guard troops to patrol the U.S. border with Mexico. Ten Alaska soldiers plan to deploy Monday to support aerial patrol operations, in support of Trump's mission to stop illegal crossings, the governor announced later. Trump, in a speech during a stopover at Joint Base Elmendorf-Richardson in late February, told Dunleavy to call him anytime he had a problem, because he'd help fix it for Alaska. As of Friday the president hadn't replied to the request, said Matt Shuckerow, a spokesman for Dunleavy. "We'll continue to monitor the progress of the project and evaluate it as proposals come forward," Shuckerow said. About this Author. Alex DeMarban is a longtime Alaska journalist who covers the oil and gas industries and general assignments. Reach him at 907-257-4317 or alex@adn.com. More about this project: "BIG TICKET". Is Alberta to Alaska Railway Port Mac's Sugar Savior? 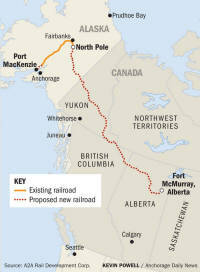 The Alberta to Alaska railway may become a reality in 2022 if Sean McCoshen of A2A Railway has his way. Published by Dennis Anderson, Anchorage Press, January 3, 2019. 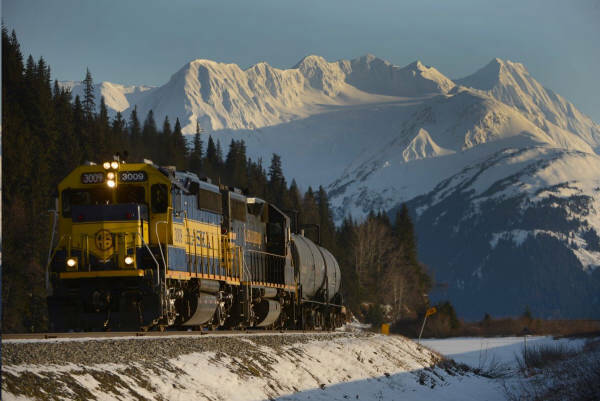 A railroad connecting Alaska and Canada may be on track for development sooner than later. By Hank Davis, ANCHORAGE (KTUU), Apr 17, 2019. Alaska Gov. Mike Dunleavy is asking President Donald Trump to grant a presidential permit to extend the Alaska Railroad into Canada, supporting a Canadian company seeking to blaze a new path for Asian-bound products. Linking the Alaska and North American rail systems, an idea more than a century old, would cut at least two days travel time for Canadian and Lower 48 cargo headed to the Far East because of shorter sea routes, supporters say. "To me it was a no-brainer," said Sean McCoshen, chief executive of Alberta to Alaska Railway Development Corp., speaking to the Senate Transportation Committee late last month. Sean McCoshen of A2A Railway has his way. He would like to see the project started by the Spring of 2019. Connecting Port MacKenzie, North Pole and Fort McMurray, Alberta.